A media mogul acts as a guide to Death, who takes the form of a young man to learn about life on Earth and in the process, fall in love with his guide’s daughter. BEFORE: A lot has and is happening today. I’ve already given my big rhetorical analysis for speech class (including two magic tricks, one with fire, that brought lots of applause) and later tonight there’s the gdgt Boston event which should be a lot of fun. To top off the day, I’m watching Meet Joe Black which, at 178 minutes, is the longest film I’ve watched since Braveheart more than two months ago on July 30. Interesting statistics from my records, 11 films have clocked in at more than two and a half hours and these opuses (or in the proper Latin, opera) have a high average rating than the rest of the marathon. Just some food for thought. 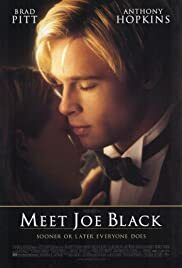 AFTER: Lightning did strike for Meet Joe Black, the second entry in the marathon from director Martin Brest (previously directed Scent of a Woman). The film had many of the same themes and ideas as Synecdoche, New York with the biggest focus being on death. The most obvious complaint would be about the time. The review summary on Rotten Tomatoes is even, “Glacially slow, uneventful.” But I thought it was quite the opposite. I can’t deny that it is a long film but most of the length is due to the acting and character reactions as opposed to frivolous and pointless scenes that don’t add anything to the plot. A scene that comes to mind is early on in the film when Susan (Claire Forlani) first meets Joe Black (Brad Pitt) in the coffee shop. When they finish, they split apart and walk in separate ways. As they walk away, they both turn around to look at the other but never at the same time and always miss the other’s glance. The scene is quite long but it is vital to the next two and a half hours of the film because it gives a meaningful insight into two of the main characters. Where I felt a little disappointed was how people reacted to seeing Death. Both William Parish (Anthony Hopkins) and even the Jamaican Woman (Lois Kelly-Miller) in the hospital seemed like meeting Death was normal. No shock or disbelief that they were actually seeing Death in the flesh. Instead they acted as if he were just another guy with nothing special about him. I found this too hard to overlook. Meet Joe Black is a film that presents an interesting scenario: what would you do if Death came knocking at your door? It’s not the best film ever, but it is certainly worth a watch if you find yourself with an extra three hours to spare on a rainy weekend day.